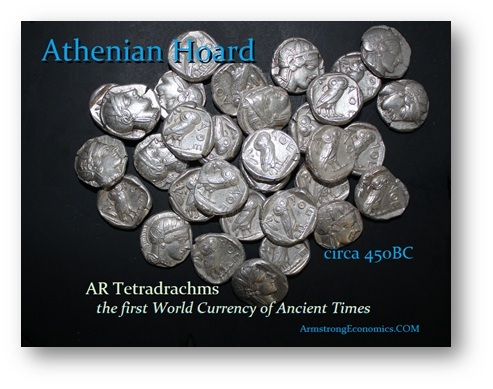 Athenian silver tetradrachms became the first recognized World Currency in Ancient times. These coins were imitated in surrounding regions because they were the recognized standard of value more so than the silver content itself. We are pleased to offer an extremely rare opportunity to obtain a coin from a hoard of the 5th century BC. Each coin will be accompanied by a certificate of authenticity signed by Martin Armstrong. This hoard is of exceptional quality generally Very Fine or better. Each coin weighs about 17.2 grams. By far, this is one of the most popular ancient Greek coins ever to have been minted. According to myth, the then-unnamed city of Athens, under the tutelage of her first king, Kekrops I, sought a patron deity. Athena and Poseidon, knowing that Athens was fated to be the richest and most powerful city in Greece, both coveted this position and the honor and sacrifices that would come with it. A contest was arranged to determine who would become the city’s protector; each deity was to offer a gift to the Athenians, with the giver of the more useful gift declared the winner. Poseidon, the god of the seas, created a spring on the Athenian Acropolis and promised that the city would become a naval power, while Athena, goddess of wisdom and war, offered the olive tree, a symbol of peace and source of prosperity. Kekrops, who was appointed a judge of the competition, chose Athena’s gift, and the city was named after her new patron goddess. Archaeological evidence indicates Athens was continuously inhabited since the early Neolithic period and was an important Mycenaean center by the middle of the 2nd millennium BC (interestingly, around the time the 1st century BC rhetorician Kastor of Rhodes’ dates the reign of Kekrops). Like other settlements in Greece, Athens fell into decline during the late Mycenaean Period but was spared the widespread destruction and/or abandonment that many Greek towns met. Athens’ population greatly expanded during the succeeding Greek Dark Age (circa 1100-800 BC) and Archaic Period (circa 800-481 BC). The growth of the peasant population was particularly significant during these periods, and the desire of the lower classes to have a voice in civic affairs had a direct impact on the foundation of Athenian democracy. The coins offered from this hoard date to a period in the 5th century BC when Athens transformed itself from the leader of an alliance of city-states to head of an empire. This was the age of the First and Second Peloponnesian Wars (460-445 and 431-404 BC, respectively), fought between the Delian League led by Athens and the Peloponnesian League led by Sparta. Predictably, the demands of the conflicts and the increasingly central role of Athens in the political affairs of Greece and beyond led to a dramatic increase in the production of coinage. Thukydides (2.13.3) records that Athens received six hundred talents of silver in tribute every year, and the city controlled a major source of silver in the Laurion Mines. Considering that roughly 1,500 tetradrachms or 6,000 drachms could be coined from each talent of silver, we can begin to get some sense of the staggering output of the Athenian mint. 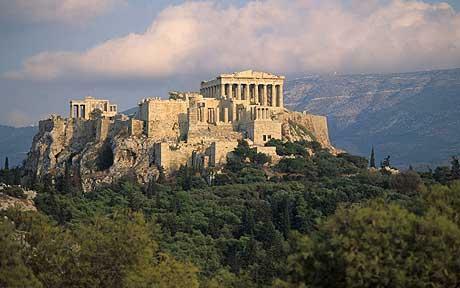 Athens over through its tyrants and Democracy was born in 509 BC. This is when Athens settled on a design that focused on her patron goddess. For centuries, Athens’ tetradrachms would carry an immobilized design with a helmeted head of Athena on the obverse and the goddess’ symbol, an owl, on the reverse. 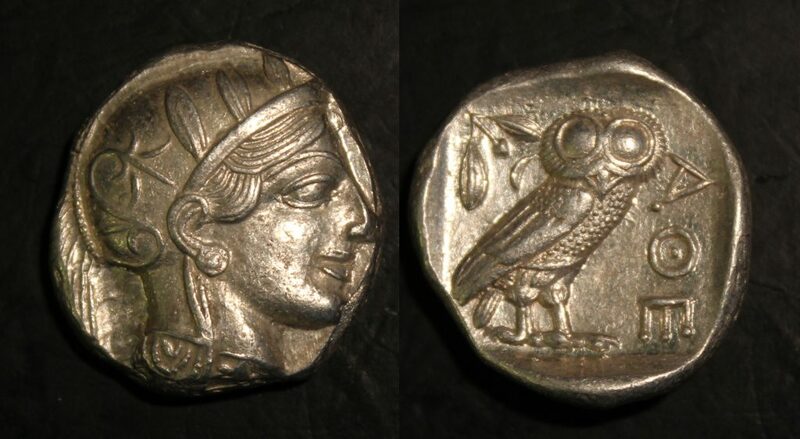 The olive sprig behind the owl referred to the gift Athena gave to its city, and, taken as a whole, the coin type serves as a proud summation of Athens’ foundation myth. Athenian tetradrachms of this type were known for their reliable weight and purity and served as the dominant currency throughout the Mediterranean. They were widely imitated as far afield as Baktria and Arabia, Egypt to the Balkans. They were the first world currency recognized everywhere and were finally replaced only after the rise of Alexander the Great’s coinage which supplanted the Owls in the late 4th century BC. In 454 BC, the treasury of the Delian League was transferred from Delos to the Athenian Acropolis, and the League’s funds were used for undertaking massive building projects intended to glorify Athens (the Parthenon being the most famous). Tribute was now paid directly to Athens, which had become an empire in all but name, and the scale of coin production soared. Certain details in the design set tetradrachms of this period apart: the leaves on the helmet are consistently attached to the visor; the form of the helmet’s palmette is modified; the letters on the reverse are gradually enlarged; and the owl’s tail is depicted as a compact prong, rather than as three flared feathers. As Athens massive output of coinage progressed during the mid-late 5th century, the mint required a large number of die engravers and it is no surprise that we encounter quite a bit of stylistic variation as a result. This is an exceptionally rare hoard of high-grade coins that are of exceptional quality. NOTE: Each coin comes with a certificate of authenticity and photograph signed by Martin Armstrong. Click here to access our online coin store.